Awesome. Whenever I feel the need for thousands of square feet of indoor air conditioning, really bright carpeting, elevators that are spaced 2 miles apart, the sound of slot machines, and $24 all-you-can-eat breakfast buffets, I go to Vegas. Actually, usually I drive through Las Vegas in route from Colorado to the beautiful shores of California, but this time I am, with intent, hopping a plane directly to Las Vegas International Airport. When I pass through an airport, I typically glance over at the passengers waiting at the gate labeled Las Vegas, and wonder why anyone would want to go to Vegas. But this week I will be one of those people at the gate. I won't be the only one. From all over this great country, bikes and bike folk converge at the Las Vegas strip annually for one big cycling industry extravaganza. This is my kind of party. Interbike. Talking bikes all day long, watching Cross Vegas at night, and getting up and doing the same thing all over again. This is the time of year between the Grand Tours, when we await Worlds, when cyclocross is just peeping it's head up from a long summer's nap, when pro contracts are being settled, and next year's equipment and sponsors are sorted out. Although many of the local bike shops already know the gear they will be carrying for the year, Interbike allows the manufacturers, retailers, industry advocates and media to come together as one big happy bike talking community. What is Interbike? North America's largest bicycle trade event and show. The website states that Interbike (www.interbike.com) gathers more than 1,100 cycling-related brands and close to 24,000 total attendees annually. 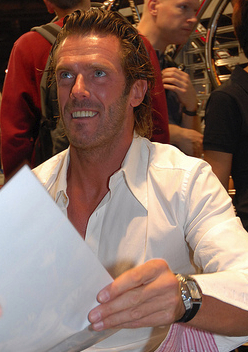 Held annually a few weeks after Eurobike, the first Interbike convention was held in 1982 in Las Vegas. They have since tried other venues including Reno, Anaheim, Philadelphia, but returned to Las Vegas in the 1990s in an odd combination of very fit people descending on the city of excess. 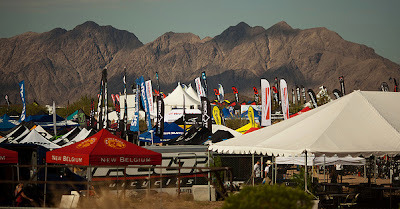 Where & When is Interbike? Sands Expo Center (behind the Venetian Hotel), Las Vegas, Nevada USA, annually in September. This year the outdoor demo took place September 12-13, 2011. The Indoor exhibit is September 14-16, 2011. What is the purpose? This might be an individual answer. I like seeing segments of the industry I would not normally see, BMX for example. Also urban bikes, mountain bikes, new product launches, many of the advocacy organizations. I like to touch and hold the products in my hands. I like to see the quality side-by-side for comparison. And of course as a traveling road cyclist I have my favorite manufacturers. I can also look at and touch those gorgeous bikes the pros ride without someone expecting me to buy one. I enjoy running into people I know. I haven't been back to Interbike in awhile. It will be good to be in the middle of it again. There are also a few celebs that show up; one of my biggest regrets is that I never got to see Mario Cipollini compete at a race, and I missed him at Interbike in 2006.
Who goes to Interbike? Manufacturer, service, and advocacy groups have personnel manning the booths to answer questions and sell sell sell. Bicycle shops (on the block and online) show up to see the products. Friends greet old and meet new friends. People maintain connections. The Interbike tradeshow is not open to the general public, you would need to be affiliated with a business to attend, and be classified as an exhibitor, attendee, advocate, or media. Why am I going? Why I am media. I was approved for a media badge to cover the event. I am attending to report on the event and the products specific to the road cyclist, traveler, and professional cycling fan. Watch the live coverage of the race online: Can't join the biggest cross race in America in person? 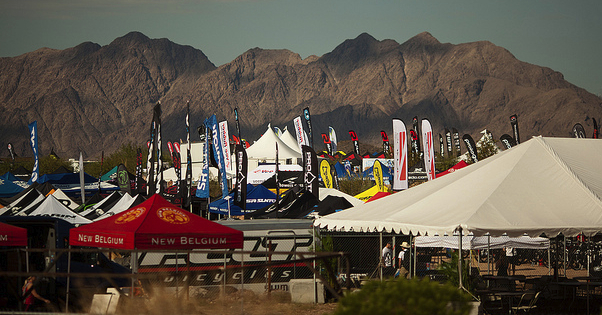 Tune into http://cxmagazine.com for more live coverage of CrossVegas. Last year a Frenchmen won the Mens Elite race! Check back to see what I learn at Interbike that will inspire occasional posts throughout the coming months to add to my usual information lists of which riders are on which ProTeams, and what bikes they are riding, and jerseys they are wearing, and pedals they are pedaling. Vegas here I come!